We’re rather fond of a Disney movie… what girl doesn’t love an afternoon of ‘The Little Mermaid’? So naturally we’re loving the new images from Annie Leibovitz in her Disney Dream Portraits. The series features our favourite stars recreating Disney scenes, with just a little hint of magic. If you’ve not seen the others, we urge you to check them out! The latest images features the scene entitled "A Tale As Old As Time" with Penelope Cruz and Jeff Bridges playing Belle and the transformed prince from "Beauty and the Beast". 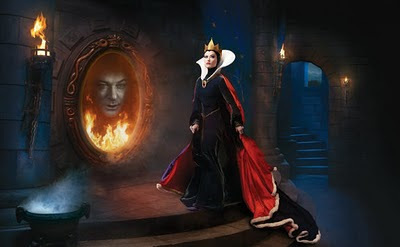 "Famed Is Thy Beauty" features Alec Baldwin as the Spirit in the Magic Mirror, while Olivia Wilde portrays the Evil Queen from "Snow White and the Seven Dwarfs"
And lastly our favourite, Queen Latifah as Ursula the Sea Witch from "The Little Mermaid"
I aodre the new photos! I loved the old campaigns so much!